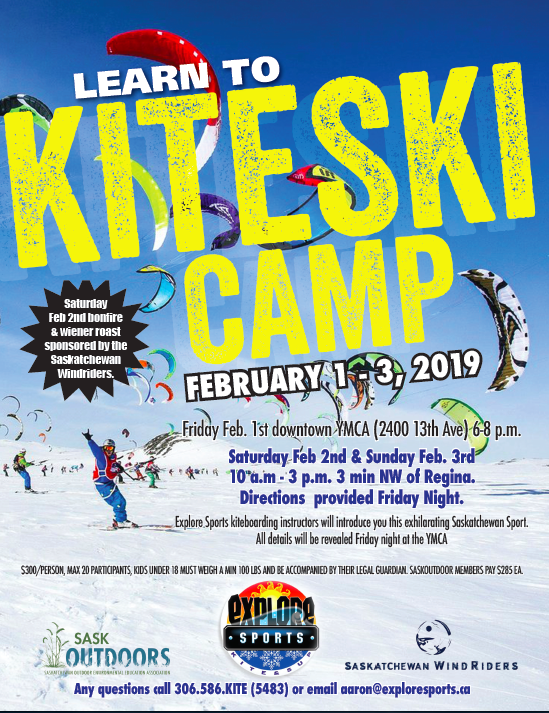 Explore Sports - Learn to Kiteski or Kiteboard winter camp! Friday February 1st , downtown YMCA (2400 13 th Ave) 6-8pm. Saturday February 2 nd & Sunday February 3 rd 10a.m. – 3p.m. kiting 3min NW of Regina. Directions provided Friday night. $300/student, max 20 participants, kids under 18 must weigh a min 100lbs and be accompanied by their legal guardian. SaskOutdoor members pay $285ea. Fill out their personal info here. Explore Sports kiteboarding instructors will introduce you this exhilarating Saskatchewan sport. All details will be revealed Friday night at the YMCA. Saturday Feb. 2nd bonfire, wiener roast sponsored by the Saskatchewan WindRiders.